Bleeding hearts offer gardeners a graceful, dainty addition to the landscape with beautiful pink and white heart-shaped flowers. This plant needs to be divided every three to five years to encourage healthy growth of the plant and abundant flowering. 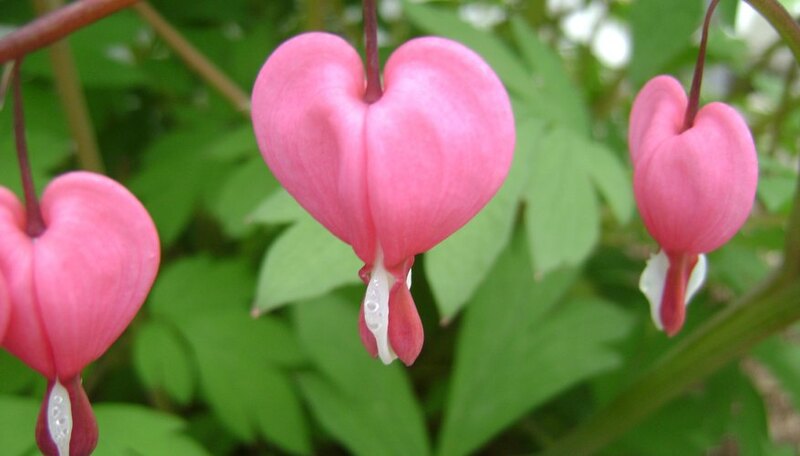 Bleeding heart will also grow into a large clump that inhibits blooming as the plant grows larger. Transplanting bleeding hearts can involve bringing a plant home from a nursery for addition to your garden or splitting an existing plant. Locate the perfect spot for your bleeding heart plant. Look for well-drained soil and moderate shade (dappled shade or two to four hours per day). Examine the root ball or container housing the plant. For plastic container plants, squeeze the container to loosen the soil inside the pot. Cut the container with clippers or press the exterior of the pot to free the plant. Some online sellers ship plants with bare roots to prevent disease and rotting of the roots. If you're planting a bare-root bleeding heart, remove any exterior wrapping and clip any plastic ties from the plant. Dig the planting hole 1 1/2 times the size of the root ball of the plant. Provide enough space to accommodate the entire root without bending or breaking any shoots. Plant shoots (green sprouts on the top of the plant) 1 inch below the soil level for plants without foliage. Position foliage plants so the top of the root ball lies 1 inch below the garden surface. Fill in around the roots with loosened soil. As you add dirt, press down firmly to remove air pockets. The soil around the bleeding heart plant should be level with the remainder of the garden. Water the base of the plant until the soil becomes damp. Adding mulch will help keep soil temperatures even and encourage water retention, although this isn't necessary. Bleeding heart reaches full growth at three to four years and should be divided in early spring or summer. At this point, you may need to divide the plant by placing a spade shovel into the center of the plant. Separate leaves and press directly down with the shovel. Lift the divided section free of the soil and firm the existing plant with additional soil.